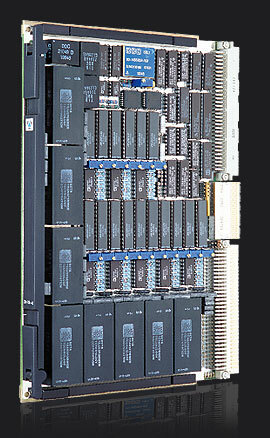 VMEbus general purpose Digital-to-Synchro/Resolver conversion module. Implements 8 D/SR output channels per board. Full galvanic isolation & Built-In-Test capability. 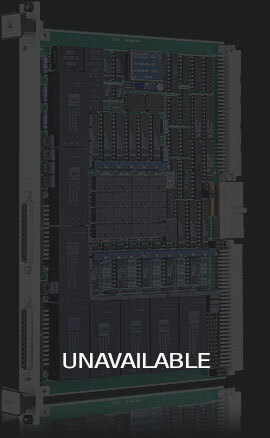 The CM-DS-40 is a general purpose S/R output VMEbus board, incorporating eight channels & features most demanded in first class military & industrial applications. 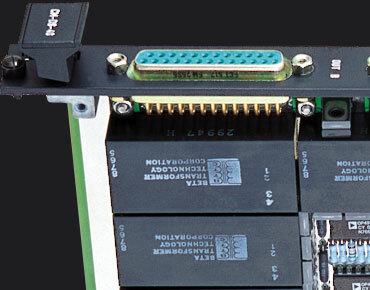 The CM-DS-40 offers a highly flexible I/O cabling solution using both the front panel & P2. Military versions with thermal overlay greatly improve capability to withstand shock & vibration. Output Channels: 8 D/R channels, 16 bit resolution. 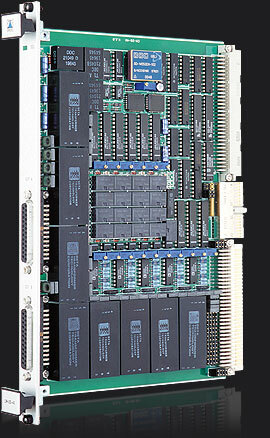 D/R Converter: 8 x CMX-7538 with 16 bit latches. Built-In-Test: A 16 bit R/D converter test all output signals. 100% coverage. CM-SD-40/883/B MILITARY 883 VERSIONControl Register: Set the module in BIT mode. Power Consumption: 4 W (unloaded), +5VDC @ 250 mA, ±12 VDC @ 100 mA. Weight: 570 gr. (I version), 770 gr. (R+ & 883 version). 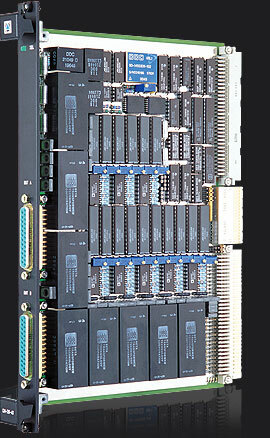 CM-DS-40/A: IEC-297 mechanics for 19 inch racks with I/O on front panel. CM-DS-40/B: Military IEEE P1101 wedgelock mechanics for ATR enclosures. 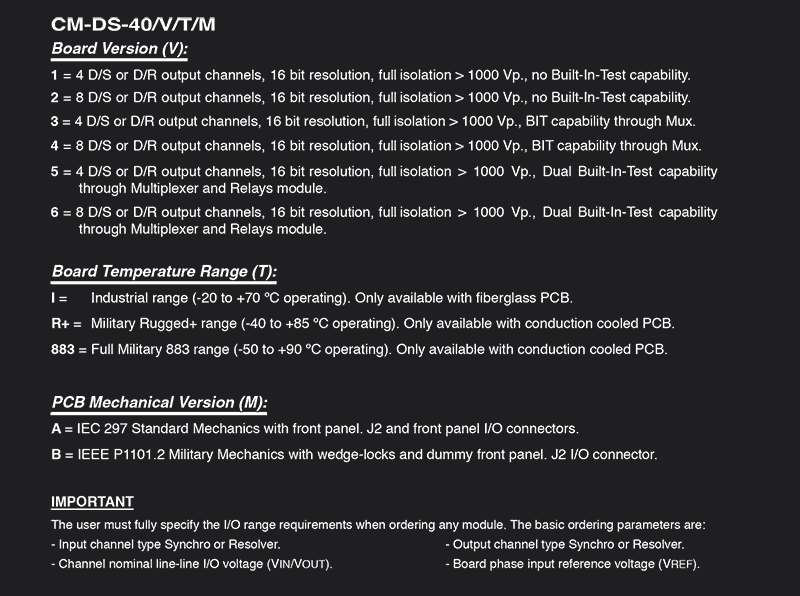 1: 4 D/S or D/R output channels, 16 bit resolution, full isolation >1000 Vp, no Built-In-Test capability. 2: 8 D/S or D/R output channels, 16 bit resolution, full isolation >1000 Vp, no Built-In-Test capability. 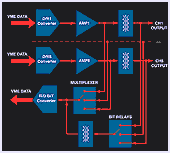 3: 4 D/S or D/R output channels, 16 bit resolution, full isolation >1000 Vp, Built-In-Test capability through Multiplexer. 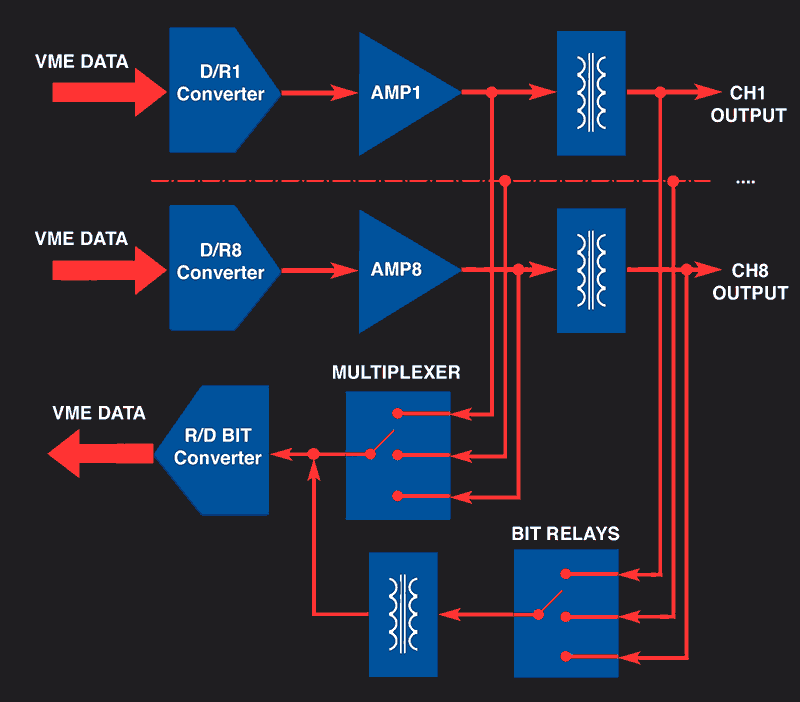 4: 8 D/S or D/R output channels, 16 bit resolution, full isolation >1000 Vp, Built-In-Test capability through Multiplexer. 5: 4 D/S or D/R output channels, 16 bit resolution, full isolation >1000 Vp, Dual Built-In-Test capability through Multiplexer and Relays module. 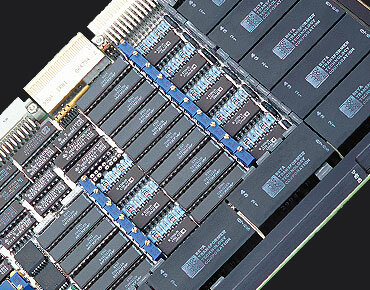 6: 8 D/S or D/R output channels, 16 bit resolution, full isolation >1000 Vp, Dual Built-In-Test capability through Multiplexer and Relays module. LEVEL 1, CM-DS-40 MAP: User´s manual. 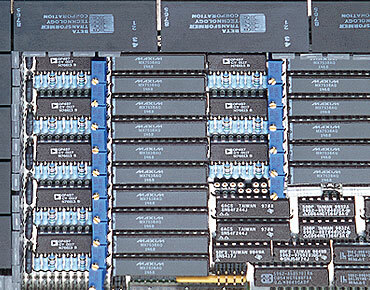 Module hardware functional description oriented toward software development. LEVEL 2, CM-DS-40 MMT: Maintenance manual. Extended description intended for failure location in the module. Input channel type Synchro or Resolver. Output channel type Synchro or Resolver. Channel nominal line-line I/O voltage (VIN/VOUT). Board phase input reference voltage (VREF). Wind River Systems VxWorks Tornado: The CM-DS-40 is supported by VxWorks Tornado & is ideal for developing real time software under UNIX environments. A complete "C" language driver in source code is available at low cost. Drivers include a floppy-disk & user's manual.